John and David Telford are identical twins who have had links with Swanbourne for 70 years. 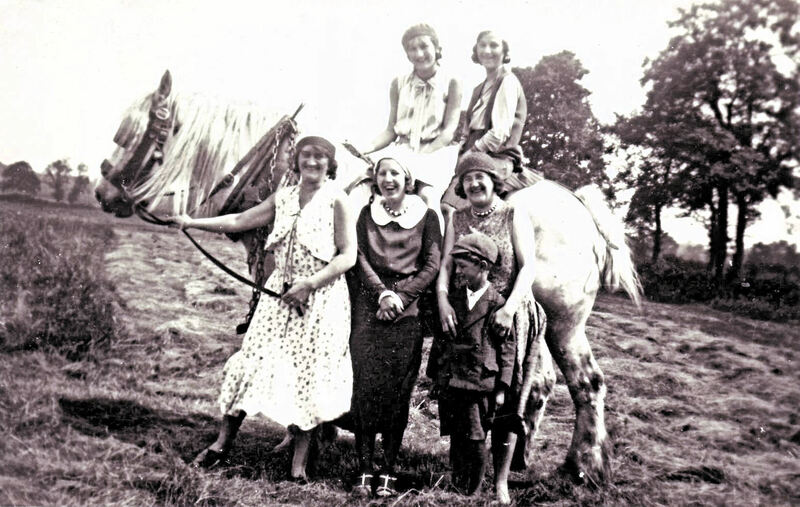 The connection began when their mother Olive Telford’s cousin Dennis Henderson (son of Ernie Henderson who lived for many years at Great Horwood with his second wife Dora), camped with his Scout Group at Nearton End Farm in the 1930s and made friends with the Tofield family. 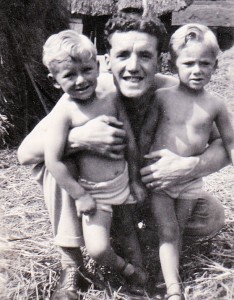 As a result, Olive stayed with Mr and Mrs Robert Tofield at Nearton End Farm towards the end of the war, to avoid London bombing, prior to giving birth to twins John and David on 15 March 1944. The local maternity hospital had no experience of twins, so the birth took place at Long Hanborough, near Witney. She remained in Swanbourne until the war ended before returning to the family home in Finchley, North London. Mary (Milly) Lambert (nee Henderson, Dennis’s sister) also stayed in Swanbourne, near the then bakery, where she gave birth to Richard in September 1944 (now Sir Richard Lambert). 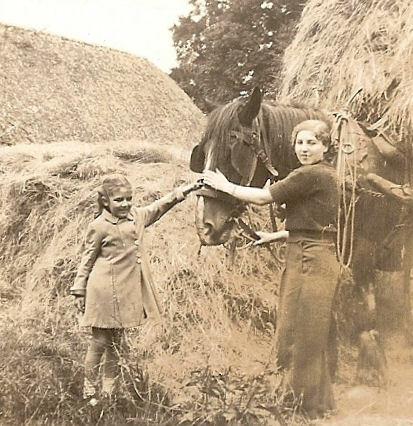 When mother brought us to Nearton End Farm after the birth, Mrs Tofield had no cots, so we were put to bed in respective drawers in a chest of drawers in the bedroom. Travelling by LMS steam train from Euston to Swanbourne with a change at Bletchley. The need for steps placed by the Swanbourne Station Master to enable passengers to alight from the train. Being collected from the station by Robert Tofield or son, Bobby, by horse and cart or tractor and trailer. Collecting fresh milk for breakfast from Bobby or John Ovens in the milking shed. Robert Tofield always having a cooked breakfast, ending up with puffed wheat, milk and sugar. Obtaining water from the pump in the farmyard for heating in the blackened kitchen range. The cold, stone floored pantry where wonderful things were kept. The range on which Mrs Tofield cooked the most amazing grub including rabbit pie. Going to bed with a candle as there was only electric lighting downstairs. Using the outside family ‘two holer’ before main drainage was installed. Playing in the barns with, by modern standards, hazardous equipment when the weather was wet. Trying to catch rabbits disturbed by harvesting (those shot by Bobby ended up in the rabbit pie). Watching hayricks built with the aid of an elevator belt driven from a tractor. Riding on ‘Punch’ the farm workhorse. Running down the hill from the milk shed in the churn cart and over-turning it into a nettle filled ditch. Feeding pigs, chickens and calves in the farm yard. Travelling by horse and trap to Aylesbury Market. Attending daughter Doreen Tofield’s Sunday School class in the Methodist Chapel. Rides in a car driven by Malcolm Ash who lived opposite at Nearton End. Sunday preachers who were provided with high tea in the 2nd lounge. The occasion when Mrs T said: ‘Shall we say grace’, while the preacher choked on the sandwich he’d already started! Being shown the top of Mursley Water Tower by the man from the water board. Visiting Bobby and Ida Tofield in the flat at the Old House. The Post Office in Tattams Lane. The Swan Pub before it closed. The opening of the Co-op store. Walking to Winslow and back in the Summer and seeing no traffic. Apart from holidays John and David used to visit Swanbourne annually in the early 1960s with the Young Peoples Fellowship from North Finchley Baptist Church to take services at the Parish Church and Methodist Chapel. David, who lived for many years in Barnet, remembers Mr Bob Tofield, when, in his 90s and living in an old folks’ home in Buckingham, reminiscing with great clarity on his visits to Barnet Horse Fair (Barnet Fair – cockney rhyming slang for hair) to buy horses that were delivered to the farm by drovers en route to Wales – in fact delivered by Rees Rees and James James, the locally well known Welsh Drovers. Olive Telford died at the age of 98 in 2010 and her ashes are buried next to the grave of Mr and Mrs Tofield in Swanbourne cemetery. 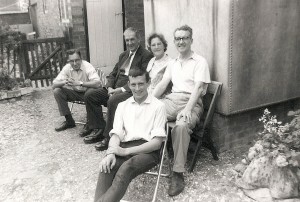 John and David have maintained the family links visiting Doreen regularly in Winslow, often at the time of the Winslow Show.